Droughts are responsible for approximately 75% of livestock deaths in the Greater Horn of Africa region, repeatedly leaving herders, their families and entire communities destitute. To protect pastoralists against this persistent threat, we helped to launch the Kenya Livestock Insurance Program (KLIP) in 2016, the first-ever government livestock insurance scheme in Africa. It is an index-based scheme that uses satellite imagery to assess the state of grazing conditions by measuring deviations in the colour of ground vegetation. When a certain threshold is reached, the insured herders automatically receive a lump sum payment, allowing them to provide their livestock with feed and water. Herding provides many people in the Greater Horn of Africa region with their livelihoods, but faces serious drought risks. 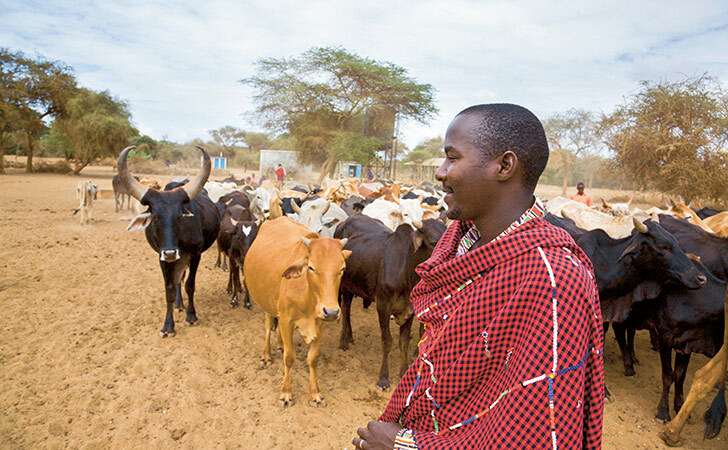 In 2017, the KLIP programme, which we support, made payouts to 14 000 Kenyan herders, thus saving an estimated 70 000 livestock sustaining 100 000 people. In 2017, six counties suffered drought conditions that triggered the programme. As a result, the government paid out about USD 5.3 million to a total of 14 000 pastoral households, or approximately USD 380 on average. It is estimated that the funds helped save 70 000 livestock, primarily cows, goats and camels, which in turn sustain approximately 100 000 people in the area. The partners behind the programme include the Kenyan Ministry of Agriculture, Livestock and Fisheries (www.mygov.go.ke), the World Bank Group (www.worldbank.org), several local insurers and the International Livestock Research Institute (www.ilri.org) in Nairobi, with Swiss Re acting as the main reinsurance provider.